This is a re-post of a recipe I created a few years ago – its gotten a lot more mileage since then thenks to pinterest, and the awesome picture my friend Ali took when she tried it…enjoy! Pre-heat oven to 350-f degrees. In a greased 2 qt baking dish, put a layer of crushed doritos (about 2 cups), then a layer of the chicken mixture. Repeat once more, ending with a layer of chicken mixture. 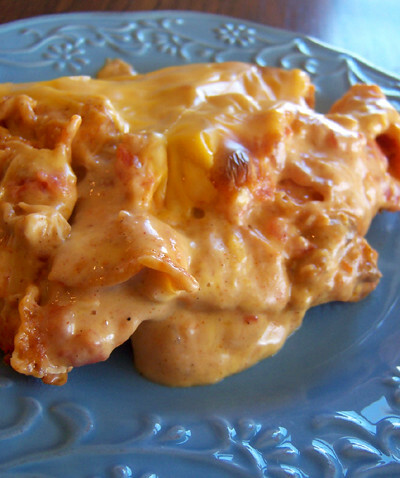 Top with more shredded cheese, cover, and bake for 30-35 minutes, till bubbling hot. You can add other items to this, depending on your preferences, like olives, green chiles, onions, etc…The chicken mixture would also make a great enchilada or burrito filling!